OK so our F# journey continues. We have looked at some of the basic building block types such as Records/Tuples, it is now time to look at Discriminated Unions. printfn "let currentLabelUnionType1 =   13"
printfn "let currentLabelUnionType2 =  Int 23"
printfn "let currentLabelUnionType3 =  \"Cat\""
let currentLabelUnionType4 =  String "Cat"
printfn "let currentLabelUnionType4 =  String \"Cat\""
You may also use empty unions. Which are ones where you do not specify a type. 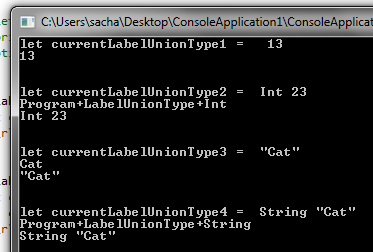 This makes them much more like standard .NET enum values. Here is an example of that. | Jack -> printfn "its a Jack"
| Queen -> printfn "its a Jack"
| King -> printfn "its a Jack"
| Ace -> printfn "its a Ace"
So we have now seen some examples of how Discriminated Unions work. So what do you think would happen if we had a F# library that used Discriminated Unions and we chose to use that from C#/VB.NET. Do you think that would work. The answer is sure it would. I will be doing a whole post on Interop somewhere down the line, but I just thought it may be fun to visit part of that right now for Discriminated Unions as they are so different from anything we see in standard .NET programming. And the run it through a decompiler, such as Reflector / DotPeek (whatever you have essentially). I used DotPeek and got this C# code for that single line of F#. So as you can see the F# compiler is doing a lot of work to esnure the F# types will interop nicely with regular .NET such as C#/VB .NET. 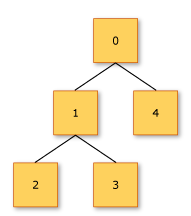 In the following code, a recursive discriminated union is used to create a binary tree data structure. The union consists of two cases, Node, which is a node with an integer value and left and right subtrees, and Tip, which terminates the tree. The other thing to note is that the sumTree function is marked with a “rec” keyword. What does this magic incantation do to our function? Well it marks the sumTree functions as one that will be called recursively. Without the “rec” keyword on the sumTree function, the F# compiler would complain. In this case the compiler would issue the following error. // the expression: a + 2 * b. // table of values for the variables. I appreciate what you are doing here and find your posts both informing and intuitive. I have spotted what I think are a few errors though. I totally cocked that up. Cut and paste madness. I have fixed that now. See told you all I was writing this from a beginners point of view.